At the 2017 Miami International Boat Show, Honda Marine will introduce a bold new concept engine inspired by the collective Honda lineup – including automotive, marine and aeronautical. The design concept engine is a blue sky vision for what future marine engines could look like. Designers at Honda’s Advanced Design Group were given a ‘clean sheet of paper’ opportunity to design a concept motor that could be applied to a variety of engines. 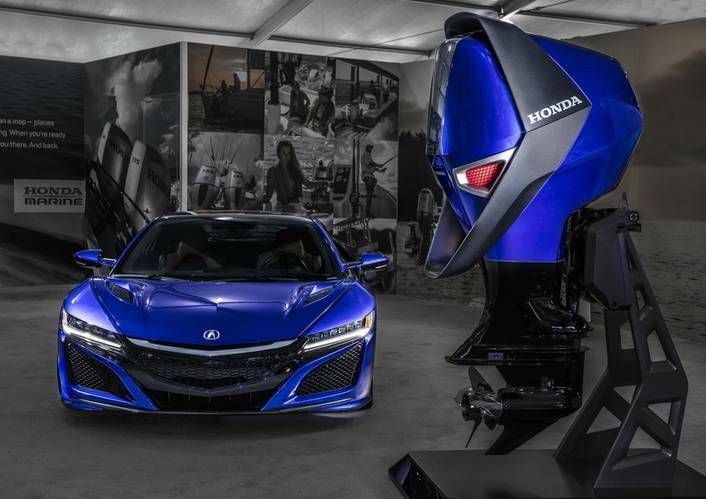 For design inspiration, the group looked across the portfolio of Honda’s varied product lineup, from current marine outboard motors to automotive products like the Acura NSX Supercar, to the Honda Jet. The group started with some sketches and then moved to digital modeling to create the dimensions and look of the concept engine. “The inspiration for the design of this engine was driven by the feeling you get when at the helm of a powerful boat on the water – the rush of excitement, the exhilaration and freedom, the feeling that hits you immediately with the boat at full throttle and the water and air around you,” said Will Walton, Assistant Vice President – Honda Marine. 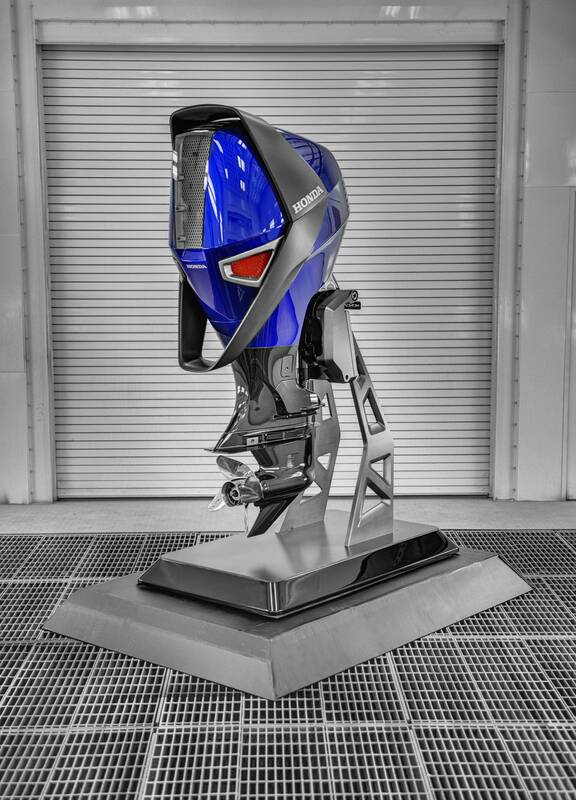 Honda designers created a concept engine that was taller than conventional marine engines. The sculpted lines tie the concept engine to the traditional marine engine shape and functionality, but promise creativity with regards to what could power the concept engine. The result? Modern, technical form language which creates a tailored package and gives a slimmer, more vertical appearance to the marine engine. For aerodynamics, the tailored packaging of the Honda Marine concept engine includes a sculpted center channel inlaid with a honeycomb mesh trim. The heat ducts feature an interwoven design with black honeycomb mesh reminiscent of the intakes on the 2017 Acura NSX. Inspired by the 2017 Acura NSX Supercar, the design concept engine’s floating winged blade is a result of angled surfacing and an overlapping form, which creates the floating wing blade and helps reduce the overall appearance of the large size, resulting in the concept engine having an aerodynamic, sleek, vertical look. The Nouvelle Blue Pearl color of the design concept engine matches the 2017 Acura NSX on display. 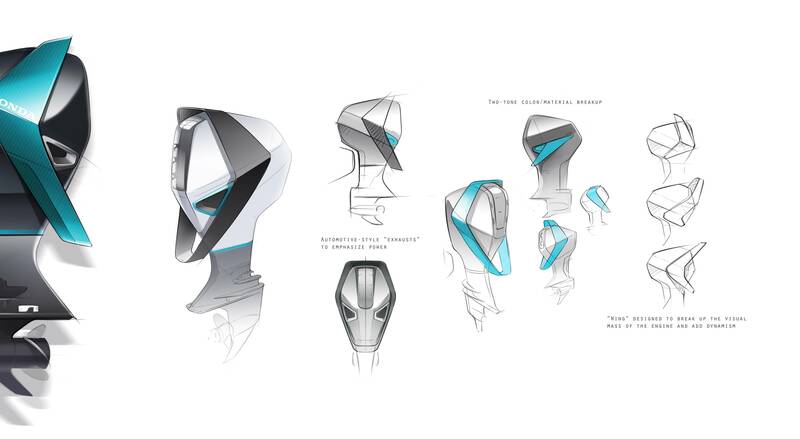 The design concept engine could be available in a variety of colors to match the lifestyle of the customer. 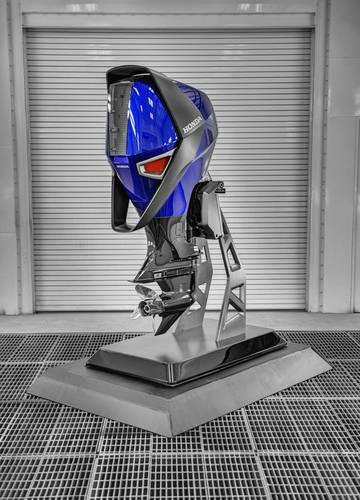 While there is currently no production intent for the Honda Marine engine design concept, it speaks to the innovation and opportunity in multiple marine engine markets. The Honda Marine engine design concept delivers a vision of the boating lifestyle of the future. The Honda Marine engine design concept follows on the heels of the introduction of: the new Honda BF100; BF225 and 250 White motors; iST (intelligent Shift and Throttle) for the BF250; the all new BF4, 5 and 6 engines; soon to be released BF40, BF65 and BF105 Jet Models; and new for Miami, the redesigned BF40 and BF50 engines. All within a 24-month time span. Honda Marine also will spotlight the new Blackshear 200VSK skiff. Honda Marine entered into a partnership with H2O Sports Manufacturing, LLC in 2016 for the production of the Blackshear line of skiffs, which are exclusively powered by Honda Marine Engines. Initially, the lineup will consist of two V-bottom skiff models, the 20-foot 200VSK and 22-foot 220VSK. Both are constructed with high quality boat building materials and exceptional craftsmanship. Two additional models will later join the Blackshear line-up in 18-foot and 24-foot variations. Honda Marine will ultimately supply the entire Blackshear model line with power ranging from the Honda BF50 to BF250. The 2017 Miami International Boat Show marks the debut of Honda Marine’s refreshed 2017 BF40 and BF50 marine engines. With the new Honda signature “crouching form” design, a new multifunction tiller handle (late availability), a multi-function-display with trolling control and a new switch panel application for multiple engine installations, the refreshed Honda Marine engines deliver consumers upgrades they will appreciate every time they take out their boat. In addition, the new BF40 and BF50 models have added a new freshwater water flushing hose for ease of maintenance, have reduced engine vibration at idle compared with the previous models and achieved Safety of Life at Sea (SOLAS) certification.